Locate the P3 elevators at the south end of the parking structure. Take the parking structure elevator to Floor 2. Turn left after exiting the elevator and enter the Taubman Center. The Welcome/Registration Center is on your right. Here you will receive your "blue hospital card" or you may update your registration information. If you are visiting a patient in University Hospital South, you must check-in at the "Big Bird" lobby, on your left, to get a visitor pass. 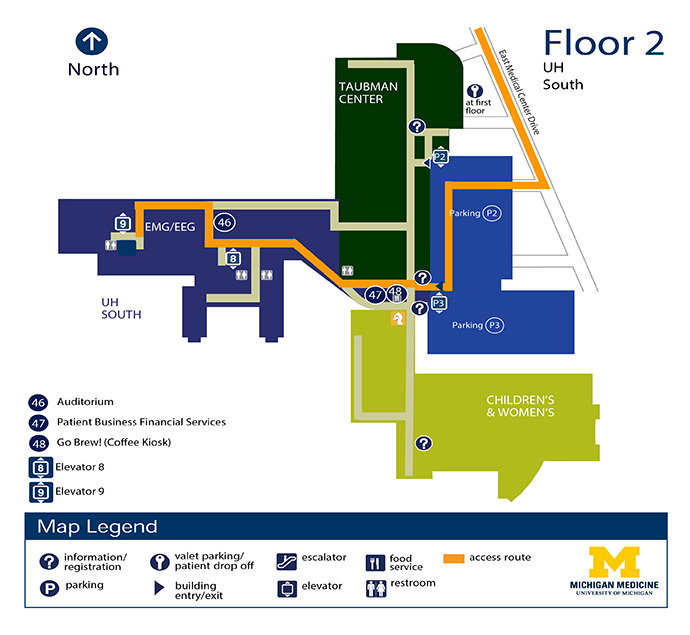 Proceed straight through the Taubman lobby into University Hospital South. Look for signs to Elevator 8, for access to patient rooms on floor 6.